The Story Bodyguard is hosting a Book Party. 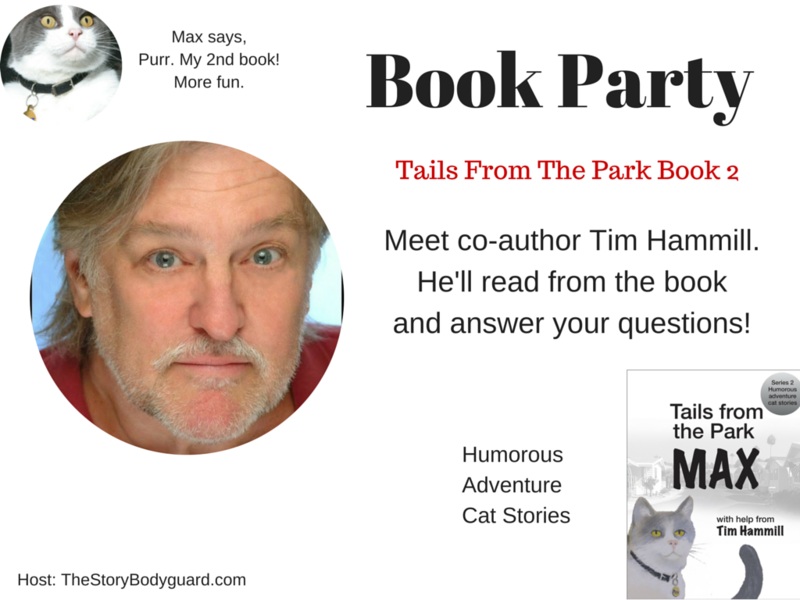 +Max Tails and +Tim Hammill are releasing Book 2 of Tails From The Park Saturday, August 22. They are having a Book Party to celebrate. Tim will talk about working with a cat as co-author. He'll be reading from the book. Come join the fun. RSVP at http://ccst.io/e/zaraaltair12. Then join us at 10 AM PT/ 12 Noon ET/ 6 PM BST. Meet Max, a cat who tells stories, collected in a series of humorous, adventure tales full of laughter, tenderness, and escapes in Tails From The Park. Max has an abundance of hereditary feline curiosity. What starts out as innocent exploration often leads to unintended escapades. He lives with his human Mom and Dad in a mobile home park where life is simple, unless you are a cat. Full of colorful characters whose sentiments can turn Max from quiet napping intermission to extraordinary mayhem each story sets its own pace. Best of all, you’ll discover Maxitude. Max has a way of telling which is full of curiosity and vigor. Life is best with Maxitude. No Where Man: A misty morning. All Buicks Great and Small: A Buick and a lost friend. The Fortune Teller: Max get’s his fortune read and creates some word magic. The Earth Moved Under My Paws: A leash, a quake, a dream, a run. Pete and Repeat: Short and snappy. Ka-Bing: Max goes to jail. Heidi Fang: Adventure with a beauty. Of course, Max has trouble interfacing with computers and their periphery. His best skill is waiting patiently for paper to come out of the printer so he can pounce. He enlists his human friend, Tim Hammill, as an intermediary to put the stories into words. Curl up for lighthearted entertainment and get your Maxitude. If you are an author and want to hold a Book Party get in touch contact@TheStoryBodyguard.com. We love authors and book parties.